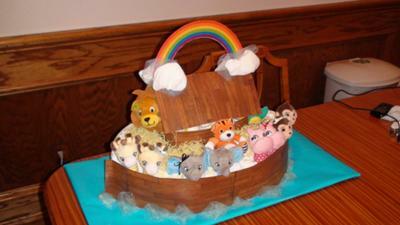 This is my first diaper cake/ark. Thanks to all the great cakes and ideas I saw on this site! 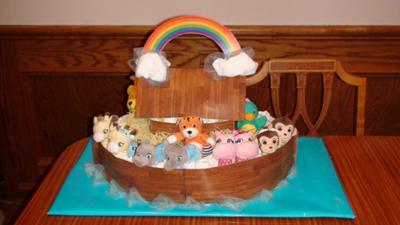 The ark has 75 diapers (35 newborn and 40 size 1), wipes, diaper cream, bath soap, 24 baby washcloths, and a variety of animals, which are rattles, stuffed animals, and hanging animals that vibrate or make music. I made this Ark as part of a gift from a group of us. We each signed a diaper or two using a permanent marker to write words of encouragement for the middle-of-the-night diaper changes. Hopefully, as she takes the Ark apart, she and her husband will have a laugh at what they find inside.